Blinds are a traditional window covering at an affordable price point and are still very popular. Blinds offer privacy and light control in a user friendly package. 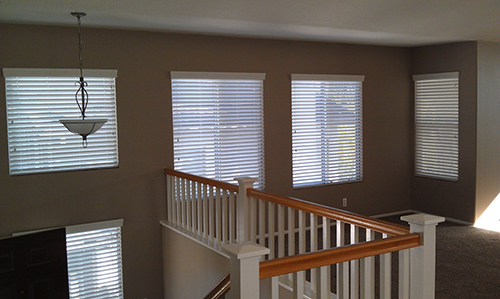 Infinity Window Coverings offers both Horizontal and Vertical Blinds in a wide variety of styles and colors. We feature Horizontal blinds in 1", 2", 2.5" and 3" sizes, in Fauxwood (vinyl based material), Wood (100% basswood), and Aluminum materials. For a traditional “venetian blind” look we can even provide you with fabric tapes in several colors on most Horizontal Blinds. We also have dozens of Vertical Blind styles in PVC, vinyl, and cloth in a wide array of textures and colors with various valance options. Since all our Blinds are custom manufactured, we also have the choice of either wand or cord controls on most Blinds. Almost all Blinds feature a limited lifetime warranty! &bigstar;Tons of options including cloth tapes, custom valances, routeless slats, and motorization!